The Washington Blue Sox (4-3-2) defeated the Palm Desert Coyotes (1-7-1) 11-1 in game one at the auxiliary field on Monday. Mark DiTammaso and Paul Rambau combined for six hits in the Blue Sox victory with Rambau driving in three runs. The Blue Sox opened up the ball game with a seven run sixth inning. Coyote’s outfielder Matt Marquis picked up a hit in his California Winter League debut. 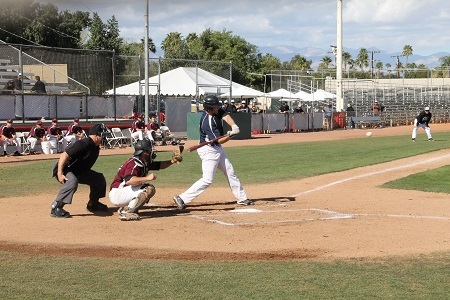 Nathan Tomaszewski drove in the only run for Palm Desert with an RBI groundout in the sixth inning. Blue Sox starting pitcher Sean McIntyre pitched four scoreless innings rendering just two hits and striking out three earning his first win of the winter. Reliever Michael Schaub picked up a three inning save striking out seven. Michael Schroeder was charged with the loss for Palm Desert. Offense was once again the story in game two at the Auxiliary field as the Palm Springs Power (4-4-1) beat the Canada As (4-4-1) 10-4 Monday afternoon. Tyler Surnbrock gave the Power an early 3-1 lead thanks to a three run homerun in the bottom of the first inning. Travis Clark continued his hot hitting going 3-for-4 with a run scored. Matt Lowenstien opened the gap wider with a two run triple in the second. Larry Balkwill went 1-for-3 with a double and two runs scored for the As. Justin Cureton added the Powers lead with a two run homerun in the fifth inning, his first of the season. Power starting pitcher Steve Landell picked up the win, his second of the season while Jaspreet Shergill was pegged with the loss. Pitching has been red-hot for the surging Oregon Lumberjacks and Kagen Hopkins continued the trend by throwing five scoreless innings en route to the win. Hopkins struck out eight and allowed just one hit and one walk, but still faced the minimum fifteen hitters thanks to his catcher, Vincent Difazio. Difazio threw out both baserunners who attempted to run on him and quickly killed any Chill rally before it could begin. Joseph Perrota and Kevin Rodgers each threw a scoreless inning to close the win out for the 6-3 Jacks. Four Chill errors and timely hitting for the Jacks put this game out of reach. Matthew Thomas led the way with three hits for the Jacks while Nash Hutter had two hits or his own and scored twice. The Midwest Haymakers took on the Coachella Valley Snowbirds in the second game of a double header at Palm Springs Stadium. It was all Haymakers as Jessie Holiday pitched four innings giving up just one run to earn the win. The Haymakers offense was led by hot hitting Michael Hur, who hit a no doubter over the left field wall to lead off the sixth inning. Casey Canon started the game for the Snowbirds. Cannon pitched two innings and striking out two. In the end the Haymakers defeated the Snowbirds 5-2.